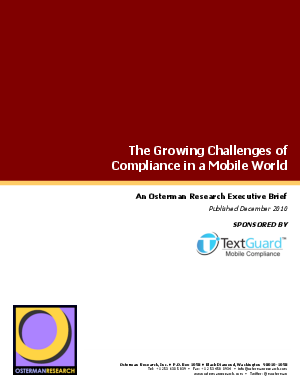 The Growing Challenges of Compliance in a Mobile World White Paper by Osterman Research. Mobility in its greater context - namely, enabling employees to work from any location - is becoming more common as a means of increasing organizational flexibility, reducing operating expenses, reducing taxes and improving customer service. Mobile messaging is a key component of this trend by enabling properly equipped workers to send and receive email, SMS, and other types of mobile messages (e.g., BlackBerry Messenger [BBM] and other types of mobile instant messaging); to access the Web and Web 2.0 applications; and to use corporate applications and communicate in a variety of ways regardless of where they work.